Is your insomnia linked to stress? When you go to bed at night, are you suddenly aware of your heart beat, muscle tension, and bodily warmth? A drug now in the pipeline may one day be available to treat stress-related insomnia—if it measures up to its developers’ expectations. New medications are expensive and time consuming to develop. So many drug companies are now bent on repurposing drugs whose side effects suggest other possible uses. In the world of sleeping pills this is déjà vu. Over-the-counter sleep aids like ZzzQuil and Sominex, whose active ingredient is diphenhydramine, got their start with the first-generation antihistamines that came on the scene in the late 1940s and 1950s. These antihistamines were originally sold to combat allergies and relieve cold symptoms. But none were free of the side effect of drowsiness. So manufacturers like Rexall and J.B. Williams decided to cash in on that property and market them as sleeping pills instead. Drowsiness is also a side effect of some antidepressant medications. Doxepin, an old tricylic antidepressant, is one such drug. It achieves its sedating effect by blocking transmission of histamine—even at very low doses. Somaxon Pharmaceuticals saw a money-making opportunity here. Silenor, a drug the company “developed” for treatment of sleep maintenance insomnia and which came to market in 2010, is the equivalent of low-dose doxepin. Now a company called Blake Insomnia Therapeutics is developing an insomnia drug whose main ingredient is the beta blocker nebivolol. As a class, beta blockers are used to treat hypertension and cardiovascular conditions. They block the effects of the stress hormone epinephrine (Adrenalin). This causes blood vessels to expand, lowering blood pressure and heart rate. Yes. First- and second-generation beta blockers have been found to cause insomnia and nightmares in some users, as well as reductions in REM sleep. Beta blockers also block secretion of melatonin, a sleep-friendly hormone released at night. Nebivolol, a third-generation beta blocker, is different, the research shows. It does not inhibit melatonin secretion. Nor, taken in the evening, does it cause morning drowsiness—a common shortcoming of many sleeping pills on the market today. Chronic stress-related insomnia is fueled by several factors that feed one another. Some are psychological, such as rumination and anxiety about sleep. Others are physiological, affecting heart rate and skeletal muscles, among other things. Awareness of the physiological symptoms of arousal—such as an increased or erratic heart beat and muscle tension—tends to escalate anxiety, which in turn exacerbates the physiological symptoms, and on and on. Pretty soon you’re caught up in a vicious circle and unable to calm down. Will the Drug Ever Come to Market, and When? The good news here is that the new compound, called Zleepax, is made from substances that are generally recognized as safe in the United States and Europe. So the company can skip phase I testing altogether. If the drug is eventually approved by the FDA, its main selling point will be that unlike many insomnia medications—scheduled drugs associated with the risk of developing tolerance when used long term—Zleepax does not cause morning drowsiness or carry the same long-term risks. Phase II testing is set to begin this year. If all goes well, Phase III testing will follow. The company is projecting a product launch in 2022. But the road to FDA approval is fraught with challenges. The company is still trying to raise money to fund the necessary trials. The drug’s performance could be lukewarm in large-scale tests. Undesirable side effects could be discovered along the way. Even so, the drug sounds promising. Too bad the development process cannot be speeded up. Does a drug like this sound like it might be helpful to you? Since my insomnia is clearly anxiety-related, this got my attention. Lois, have you published a review of anti-anxiety meds that have been helpful for the sleepless? I am now taking carbamazepine (branded as Epitol), which was a replacement for oxcarbazepine. The replacement was to fix the sodium problem, but I do not find it as effective as the original. I know that one day, it will not work at all, so knowing what I can ask for certainly helps. The good news is that my regimen now (Epitol and Gabapentin 300) seems to be sufficient most of the time, sparing me the “sedation-stimulation” cycle caused by explicitly sleep-inducing drugs (i.e., alprazolam, eszopiclone, zolpidem, etc). 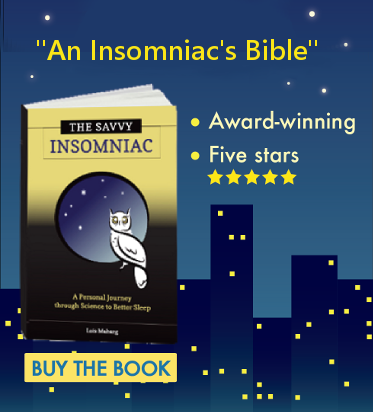 I haven’t reviewed anti-anxiety medications that might help people with insomnia (although I reviewed all medications approved for the treatment of insomnia in chapter 11 of my book, The Savvy Insomniac). This sort of review would be way beyond the scope of what could be published in a blog post. Besides, if and when anti-anxiety meds are prescribed for insomnia, they’re being prescribed off label. 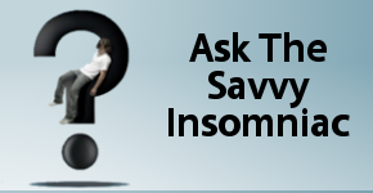 No clinical trials have been conducted with insomnia sufferers taking drugs typically prescribed for anxiety and/or seizures (although a few trials have been conducted to see how well certain antidepressants work for insomnia). There’s little published information out there about how well anti-anxiety and seizure medications work for insomnia. Clinicians who prescribe them would be a better source of information here. That said, most drugs approved for the treatment of insomnia work by facilitating the action of neurotransmitters active during sleep. Only recently have researchers interested in insomnia begun to think instead about blocking the action of neurotransmitters active when we’re awake—which seems to me like a more promising way to go about calming the insomniac brain. Two such drugs are Silenor and Belsomra, both approved for treatment of sleep maintenance insomnia. Reviews from people who have tried Belsomra and written about it on this blog have been lukewarm. The drug I write about in this post—Zleepax—is the first I’ve heard of people developing an insomnia drug specifically aimed at down-regulating activity of the sympathetic nervous system (which is heightened during stressful situations and elevated in people with anxiety). This may be an effective way to alleviate stress-related insomnia. We’ll have to wait and see. My doctor prescribed Belsomra, and I did not get it filled. It is, to this old retired guy, prohibitively expensive. I am surprised so few people mentioned its incredible price tag. The effectiveness of gabapentin (Brand name Neurontin) seems a far better route. Thanks for the (as always) well-informed (savvy?) response. A few people who commented on the posts about Belsomra did mention how expensive it was. Unfortunately all newly patented medications—including Zleepax, if it ever comes to market—are going to cost a lot. Medications like gabapentin, for which the patent has expired, are much less expensive. It’s good you’ve found a generic drug that works for you.